There are said to be four graves in Rossendale on private land. At least two, and possibly all four of these have links to my area. The first is that of Richard Ashworth, one time pastor of Sion Baptist church who was buried at his request in the garden of Carr House, Hall Carr in 1751 after 52 years in the pastorate. 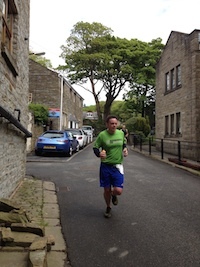 The second is that of James Ormerod and is in Higher Cloughfold, to the south of the east end of Patrick Crescent. Beneath Are deposited the earthly Remains of JAMES ORMEROD INNKEEPER who departed This Life the 9th Day of NovR 1817, in the 57th Year of his Age Dear, loving faithful Partner now farewell With whom it was my Happiness to dwell With whom I was united Heart with Heart From whom it is so painful thus to part Yet shall the gracious Hand that thee took hence By Love divine thy Absence recompense Prepare me for the bliss thou hast & then Eternity unite us both again When we this good Man’s Life explore We cannot but allow, Whate’er this Place might be before ‘Tis consecrated now. Local legend has it that his burial at this site was due to suicide debarring him from the local parish churchyard. Possible, but I have been unable to verify this. Thomas Haworth's son in law witnessed the will of James Ormerod, whose grave is described above. For good measure, James Ormerod was trustee for the will of James Haworth jnr, son of the James Haworth who was the third of these four. This leads the people at English Heritage to speculate that all four were involved in the same Baptist congregation. Whilst they discuss the Baptist chapel at Goodshaw, if this is true it is more likely to be Sion with Richard Ashworth snr's pastorate there. There are gravestones in Sion dating from before this period so burial there was an option. Well this is interesting. I haven't (yet!) obtained the wills in question or verified that the James Ormerod in the wills is the same as that in the burial. 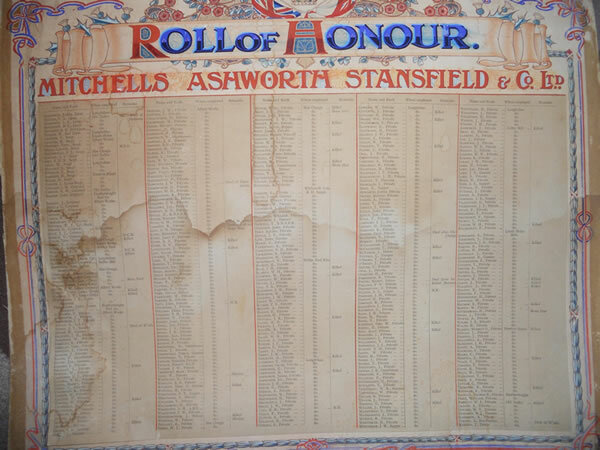 All the names involved - Ashworth, Ormerod and Haworth - are pretty common locally and untangling them all is some undertaking. More playtime! But this James Ormerod is plainly described as an Innkeeper. 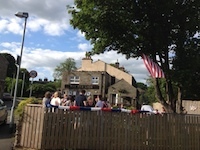 Now Sion at that time was a Strict Baptist church and the temperance movement was strong in Rossendale (reflecting in part the strength of non-conformity, including the Methodists). It would be interesting if there were nonconformist Innkeepers of sufficient piety to prefer burial on private ground. Except…Sion graveyard also includes the burial stones of the family of Thomas Tattersall, Innkeeper, dated 1873. Of whom more later. But there does appear to have been Innkeepers active in the congregation, at least by this date. 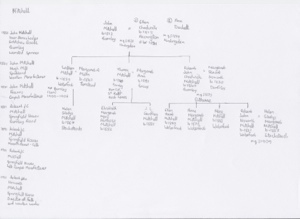 Alice Nuttall ticks all the boxes as she is both a Springhill resident and one of my direct ancestors (3xg gm). 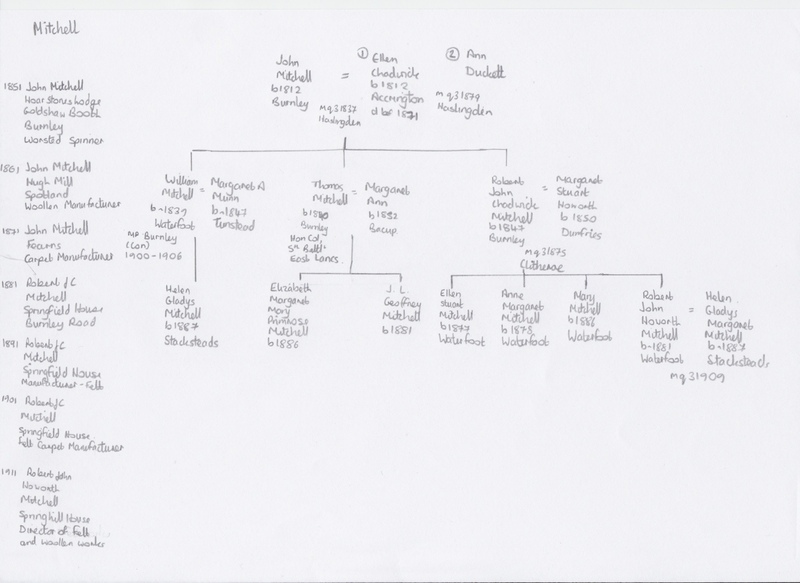 Although 5 generations of my family have lived in our house, Alice was not one of them. Alice lived in the Cloughfold area all her life, being born there in 1819 and baptised at Newchurch St Nicholas on 1 Sept 1819. She was the daughter of John Ashworth, weaver, and his wife Betty. On 31 Dec 1837 she married Richard Nuttall in St Nicholas. She was a minor at the time of her wedding, a useful fact in trying to demonstrate just which of the 'Alice, daughter of John' she was. Jane b 1842 - my ancestor. Her first husband, John Taylor (my ggf), was rather gruesomely killed in a quarry accident. Alice lived in 3 Edge Lane for over 30 years, being recorded there in the 1861-1891 censuses. She was widowed by this time and worked as a laundress, probably taking in washing from Captain Patrick of Springhill House and others of the rich and famous of the district. Alice's example is remarkable not for the details of her life which are quite straightforward but as an indicator of the social structure of the neighbourhood and how that changed over time. Her two-roomed cottage was within 20 yards of the big house which dominated Springhill. Of the 10 houses in Springhill at the time, 5 had 5 rooms or more, 3 had only two. By 2005 the house had been knocked through with its neighbour. It is seen here on the left behind the cars. Before conversion, the estimated sale price was £238,000 or thereabouts. Not within the range of the average laundress any longer. OK, perhaps 'residents' is pushing it a bit as there is no evidence that General George Monck, 1st Earl of Albermarle, ever actually visited the place. He was certainly aware of and involved in it, of which more later. The biography of Monck, his army career and his involvement in the Civil War is pretty well documented. As most of it didn't involve Springhill in any shape or form, it is not repeated here. Monck's part in the restoration of Charles II was rewarded in a number of ways, one of which was his being granted the Honor of Clitheroe in 1661. As this includes Springhill (then known as Deadwenclough), Monck became the lord and landowner. He knew his stuff as well, down to the number of tenants and the rent owed by the mill at Holden, Haslingden. William Mitchell and his younger cousin David Crossley became independents and practicers of adult baptism in the last years of the 17th century, with Crosley being baptised in 1692. They established an itinerant preaching ministry in East Lancashire and West Yorkshire from their then base in Rossendale. It is said that Mitchell was imprisoned twice under the Conventicle Act in the 1680s. One of these is said to have been after preaching at Goodshaw, north of Rawtenstall. I have not been able to verify that. Crosley extended his circuit to include areas of the Midlands and South of England and eventually ended up in Cripplegate. Sadly his time there may have not been entirely straightforward, with rumours of excessive drinking and some indiscretion towards women. Many of the preaching stations used by Mitchell and Crosley developed into nonconformist churches in their own right. Sion was one of these so Mitchell can be described at its co-founder. He was also the first pastor of Sion chapel, Cloughfold, serving from 1685 to 1699 when he was dismissed (probably over the issue of believer's baptism) and succeeded by Richard Ashworth. Mitchell became minister of Rawdon Church, Yorkshire. He died in 1705 aged 42. Crosley returned as Baptist minister in Bacup in 1702. …but a good excuse to sell beer anyway! Robert John Howorth Mitchell was resident at Springhill House at the time of the 1911 census. He is listed as 'director, felt works' which indeed he was, being a director of MASCO of which more later. It seems a bit strange that the director of a major Rossendale company should be staying in a subdivided rented house. I initially wondered whether he was renting for a while whilst his own house was being made ready but obviously not as he was still there in 1923. Incidentally I struggled to find out when he left Springhill, only doing so when he changed his address on the register of shareholders of Great Western Railway. Robert John Howorth Mitchell was born ~ 1881 in Waterfoot, the only son of Robert John Chadwick Mitchell. RJC was one of the 'Mitchell Brothers' who founded the felt works which bore that name. In 1904 Mitchell Brothers joined with Ashworths and Stansfields to form MASCO, the firm of which RJH later became a director. 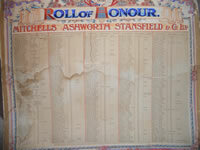 It became the largest felt works in the UK and an ideas of its size at this time can be had from its roll of honour for WW1. RJH married his cousin, the daughter of RJC's brother William Mitchell in 1910. Keeping the money in the family? I have no reason to suppose the marriage was anything other than successful.